Archipelago Hostel Old Town i Stockholm, Sverige : Boka nu! Archipelago Hostel Old Town in Stockholm is the ultimate place to stay during your visit in Stockholm. 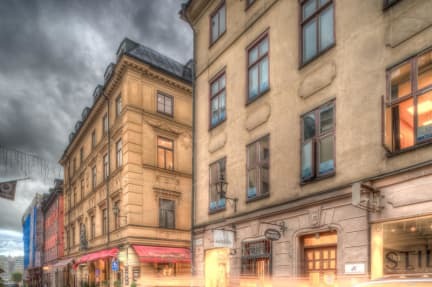 Most of the historical sites and attraction are within walking distance, like the Royal Palace, the Nobel Museum, the City Hall and the ferry to Djurgarden/Skansen. We have a capacity of 43 beds and can offer accommodation in single, twin, triple and four-bed rooms. Our dormitory is either for four or six people and is very popular for people backpacking and travelling in groups, with lockers in the room. Departure cleaning is included in the rates. All rooms have big windows and free WiFi. There are no bunk beds in the twin and triple rooms, while the superior room include an 26 LCD TV. All beds are supplied with a duvet and a pillow. Bed linen and towels are available at the reception for hire 65SEK/person including a towel (one-time fee) or alternatively you can bring your own. Please note that either way bed linen must be used. Sleeping bags are not allowed. There is a guest TV in our kitchen, where you can also find a microwave, water boiler, cooker, glasses and places. Make your own breakfast or heat up your lunch or dinner if you prefer! A free guest computer is in the lobby. The Hostel open 365 days a year, with no curfews or lockout. We welcome group bookings as well. Please note that we preauthorize your card. If your card fails to be valid we will cancel your booking. If you expect to check in after 6 pm, please inform Archipelago Hostel Old Town at least 2 days in advance, in order to receive a door code. If you checks in after 6 pm and stay only one night, so will this night be charge from your card as you indicated when you booked. If there is no money on the card, the key will not to be left for you. That means you have`t a room / bed at your disposal. Reception is open between 9.00-12.00/13.00-18.00 each day. Cancellation are required to be no later than 2 days before arrival.